Steven Siro "Steve" Vai (born June 6, 1960) is a three time Grammy Award-winning American virtuoso rock guitarist, composer and producer who has sold over 15 million albums. After starting his professional career as a music transcriptionist for Frank Zappa, Vai recorded and toured in Zappa's band for two years, from 1980 to 1982. The guitarist began a solo career in 1983 and has released 8 of his own solo albums since. Apart from his work with Frank Zappa, Vai has also recorded and toured with Public Image Ltd., Alcatrazz, David Lee Roth, and Whitesnake. Vai has been a regular touring member of the G3 Concert Tour which began in 1996. In 1999 Vai started his own record label, Favored Nations, intending to showcase, as Vai describes, "...artists that have attained the highest performance level on their chosen instruments." Vai began playing guitar in 1973, at the age of 13 with Foghat. In 1974, he took guitar lessons from guitarist Joe Satriani, and played in numerous local bands, one of which was called "The Steve Vais." He acknowledged the influence of many guitarists including Jimi Hendrix, Jeff Beck, Brian May, Jimmy Page, Glen Buxton, and jazz fusion guitarist Allan Holdsworth. Vai followed those lessons by attending the Berklee College of Music, afterwards recording a promotional piece for them in which he spoke about auditioning for Frank Zappa at age twenty. Vai mailed Frank Zappa a transcription of Zappa's "The Black Page", an instrumental for drums, along with a tape with some of Vai's guitar playing. Zappa was so impressed that, in 1979, he hired him to transcribe a number of his guitar solos, including some on the Joe's Garage album and the Shut Up 'n' Play Yer Guitar series. These transcriptions were published in 1982 in The Frank Zappa Guitar Book. Subsequent to being hired as a transcriber, Vai did overdubs on many of the guitar parts for Zappa's album You Are What You Is. Thereafter he became a full-fledged band member, going on his first tour with Zappa in the autumn of 1980. One of those early shows with Vai on guitar, recorded in Buffalo, was released in 2007. While touring with Zappa's band, Vai sometimes asked audience members to bring musical scores and see if he could sight-read them on the spot. Zappa referred to Vai as his "little Italian virtuoso" and listed him in the liner notes as performing "stunt guitar" or "impossible guitar parts." Later, Vai was a featured artist on the 1993 recording Zappa's Universe. In 2006 he returned to Frank Zappa's music as a special guest on Dweezil Zappa's 'Zappa Plays Zappa' tour, alongside friends from his early years with Zappa. After leaving Zappa in 1982 he moved to California, where he recorded his first album, Flex-Able, in 1983 and performed in a couple of bands. In 1985 he replaced Yngwie Malmsteen as lead guitarist in Graham Bonnet's Alcatrazz, with whom he recorded the album Disturbing the Peace. Later in 1985, he joined former Van Halen front man David Lee Roth's group to record the albums Eat 'Em and Smile and Skyscraper. In 1986, Vai played with John Lydon's Public Image Ltd on their album Album (also known as Compact Disc or Cassette). Then, in 1989, Vai joined Whitesnake, replacing Vivian Campbell. When Adrian Vandenberg injured his wrist shortly before recording was to begin for the album Slip of the Tongue, Vai played all the guitar parts. Vai also played on the Alice Cooper album Hey Stoopid, along with Joe Satriani on the song "Feed my Frankenstein." The song "For the Love of God" was voted #29 in a readers' poll of the 100 greatest guitar solos of all time in Guitar World Magazine. In 1994 Vai began writing and recording with Ozzy Osbourne. Only one track from these sessions, "My Little Man", was released on the Ozzmosis album. Despite Vai penning the track he does not appear on the album. His guitar parts were replaced by Zakk Wylde. Another track, "Dyin' Day", appeared as an instrumental on Vai's Fire Garden album. Vai's band members in the 90's included drummer Mike Mangini, guitarist Mike Keneally, and bassist Philip Bynoe. In 1994 Vai received a Grammy Award for his performance on the Frank Zappa song Sofa from the album Zappa's Universe. Steve Vai released a DVD of his performance at The Astoria in London in December, 2001. The performance featured Billy Sheehan, guitarist/pianist Tony MacAlpine, guitarist Dave Weiner, and Australian drummer Virgil Donati. In 2004, a number of his compositions and orchestral arrangements including some previously recorded pieces, were performed in The Netherlands by the Metropole Orchestra in a concert series entitled The Aching Hunger. In 2003, drummer Jeremy Colson joined Vai's group, replacing Virgil Donati. Vai's latest album, Sound Theories, was released in 2007. In February 2005, Vai premiered a dual-guitar (electric and classical) piece that he called The Blossom Suite, with classical guitarist Sharon Isbin at the Châtelet Theatre in Paris. In 2006, Vai played as a special guest guitarist alongside additional guest Zappa band members, drummer Terry Bozzio, guitarist-singer Ray White, and saxophonist-singer Napoleon Murphy Brock in the "Zappa Plays Zappa" tour led by Frank's son Dweezil Zappa in Europe and the U.S. in the Spring, as well as a short U.S. tour in October. On September 21, 2006, Vai made a special appearance at the Video Games Live concert at the Hollywood Bowl in Hollywood, California. He played two songs with the Hollywood Bowl Orchestra; Halo Theme, and a second song for the world premier trailer for Halo 3. Steve Vai made an appearance at the London Guitar Show in 2007 on the April 28, 2007 at the ExCeL Center. In late April 2007, Vai confirmed the release of his most recent record, Sound Theories, on June 26. The release is a two-CD set, mostly of previously released material that Vai rearranged and played with a full orchestra. Vai says the project was a great joy because he considers himself a composer more than a guitarist, and he is happy to see music he has composed played by an orchestra that can play it well. A DVD followed the record later that year. He guested on the Dream Theater album, Systematic Chaos, on the song "Repentance". The appearance was vocal rather than instrumental, as Vai was only one of many musical guests recorded. The song features contributions from many artists, with the aim of apologizing to important people in their lives for wrongdoings committed in their pasts. On August 29, 2009, he appeared on stage with Dream Theater during the final show of their Progressive Nation tour at the Greek Theater, where he performed in an improvised jam with the other musicians on tour. Broken Records magazine (Volume 1, Issue 3) quotes Vai as saying, "I enjoy challenging myself to come up with new ideas that I believe are unique." In 2010, Vai released several "VaiTunes" singles of tracks that were previously recorded and later finished. They are available on www.vai.com, iTunes and Amazon.com. On September 14, 2010, Steve released "Where The Wild Things Are" as double vinyl through his label Favored Nations and made a guest appearance with Rickey Minor and The Tonight Show Band on NBC. 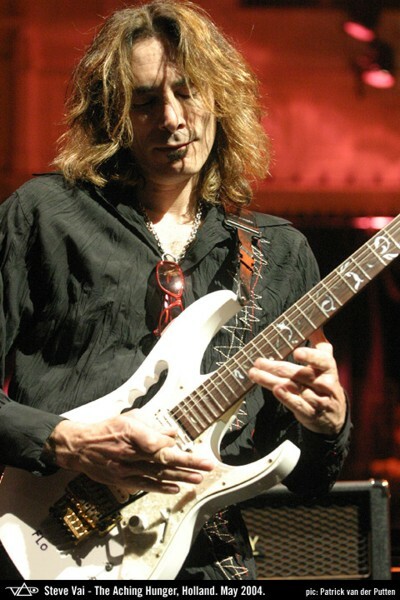 In October, 2010 Steve completed his first full symphony and performed the compositions at the Steve Vai Festival which featured Vai and the North Netherlands Symphony Orchestra (NNO) on October 20–24, 2010. Immediately after the Holland shows, Steve embarked for the US to headline the "Experience Hendrix Tour" which features Eric Johnson, Kenny Wayne Shephard, Susan Tedeschi, Billy Cox, Vernon Reid, Robert Randolph, Johnny Lang, Brad Whitford and other top-notch guitarists. On March 3, 2011 the online education division of Boston’s renowned Berklee College of Music and Steve Vai, set the Guinness® World Record for the world’s largest online guitar lesson. This first-of-its-kind initiative, held at streaming media platform Livestream Studios in New York City, brought together thousands of members of the international guitar community in a celebration of online music education. Berkleemusic and Steve Vai have also co-authored a new twelve-week online course: Steve Vai Guitar Techniques. This online course, presents students with the chance to gain a deep understanding of Vai’s death-defying playing styles, repertoire, techniques, and musical concepts from anywhere in the world, and to incorporate their learnings into their own playing. Vai is a virtuoso in the world of guitar music. His 1990 album Passion and Warfare and the ballad For the Love of God in particular received a significant amount of press and are often cited by critics and fans alike as among his best work, often noted since the entire piece, at just over six minutes, was reportedly recorded in one take. Vai's playing style has been characterized as quirky and angular, due in large measure to his technical ability with the guitar instrument and deep knowledge of music theory. He regularly uses odd rhythmic groupings and his melodies often employ the Lydian mode. Perhaps his most readily-identifiable stylistic feature is his creative use of the floating vibrato, using it to add melodic lines that sound odd to the ear. His playing can also be described as lyrical, as if sung by a human voice. During the recording of "Eat 'em and Smile," with David Lee Roth, he employed several guitar techniques that "mimicked" the human voice, as heard in the opening bars of the opening track "Yankee Rose." He often uses exotic guitars: he plays both double and triple neck guitars (including a custom-made heart-shaped triple-neck model built by luthier Joe Despagni). Vai is regarded as the first to use the 7-string guitar in a rock context. Along with Ibanez, he designed a signature 7-string guitar, the Ibanez Universe, in 1989. He is also noted for being physically expressive as he plays his guitar. “I wanted to be a composer ever since I was a young boy. To me written music on paper was (and is) beautiful. It looked like art and I wanted to have a complete understanding of how to speak, read and write that language. I knew that through the little black dots I could get the music that was in my head out into the world. Though the guitar fell into my lap and my fingers were glued to the instrument, I studied composition and musical notation long before I even started playing the guitar. Through high school, college and beyond, I kept up my studies and kept composing through the years as I felt my eventual calling was in the compositional world. Although I have listened to and studied most of the great older and contemporary composers, when I compose my music I take a similar approach as to when I am developing my voice on the guitar and that's to find and cultivate ideas that I have not heard before. That's the exciting part! Once you understand the written language of music and the possibilities and limitations of various instruments, composing music is pure liberation. It's an art form that allows for deep personal expression. For me composing is the ultimate playground for my imagination. And to have the opportunity to hear your music performed is the greatest gift a composer could hope for, provided it's performed correctly. Steve Vai is one of the few guitarists universally acknowledged as one who has changed the way musicians think about what a guitar can really do. His signature Ibanez guitars are no different: Iconic, Sublime, Awe-Inspiring, Outrageous. The Ibanez JEM Series models are trailblazers in a world of imitators – there’s nothing like them.